The moment of slugger discharge of the top battleship "Mikasa." A column of water is an enemy's impact. 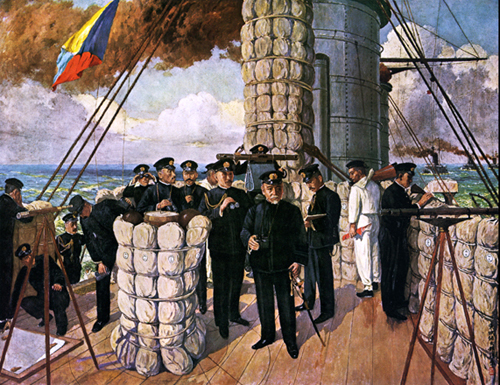 just before the naval battle in the Sea of Japan is started on May 27, 1905.
around 1:57 p.m. in front of the battle start which has taken down "Z signal flag" which finished transfer on each warship. Z signal flag means "Existence of the country is in this battle. Therefore, make much more strenuous effort each one." the upper exposure enclosed bridge, the custom put an officer's Guntō, the dirk, and the dirk of the signal private on the lower enclosed bridge also during the battle. Cutting down a desperate open sea game, the officer on an enclosed bridge is not carrying the Guntō for pride. The reason is for producing an error, if iron approaches the big compass of the center of an enclosed bridge. Therefore, when going up to the upper exposure enclosed bridge, the custom put an officer's Gunto, the dirk, and the dirk of the signal private on the lower enclosed bridge also during the battle. However, Director Tōgō has grasped the Guntō tightly only one person in such a custom. It is manifestation of Director Tōgō's desperate preparedness. This Guntō is the Imperial properties by which the lower result was carried out to Admiral Tōgō on the "Mikasa" enclosed bridge in strategy off Lushun through His Imperial Highness the Crown Prince's (next Emperor Taishō) officer in attendance on His Majesty at the time of the naval battle of the Yellow Sea of the previous year of the naval battle of the Sea of Japan. He taught and did the carrying of this blade to the saber mounting of the both-hands grip. Ichimonji-Yoshifusa is the sword which Yoshifusa in front of 700 old years (Kenpo annual 1213 year) forged. etc. in future generations, it was a heterogeneous sword. The military swords (Guntō) was unnecessary to the fleet decisive battle. However, a short-distance gun game is a hand-to-hand combat of a fleet. Therefore, Tōgō was not able to part with the Japanese sword of a samurai's soul. In the modern warfare, the members of the armed forces encouraged soul by having a Guntō. 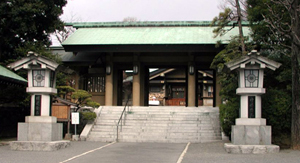 The meaning of the Guntō is directly expressed to this sight. admiral Heihachiro Tōgō (he is a marshal behind) did the carrying. The mounting and blade of this saber Refer to naval Guntō "Yoshifusa." All the officers are doing the carrying of the command-sabre. Courtesy worship of the navy of each country does not cease still now. 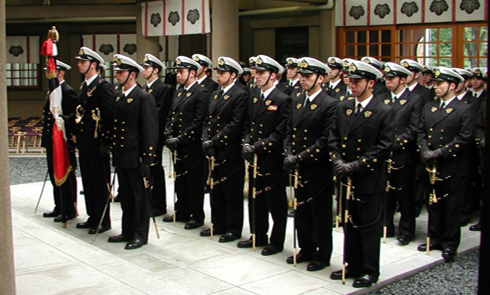 It is a clear proof of "Admiral Tōgō" being venerated from the navy in the world. "The figure of the Mikasa enclosed bridge", and "Yoshifusa mounting" photograph offer: "Tōgō society" Mr. Katsuma Nojiri.